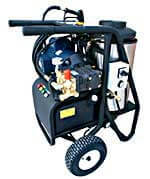 3000SHDE is a hot water pressure washer that runs on 230V and 34amp. This great machine operates with 7.5 horsepower and it produces 3000 PSI and 4 GPM. This model is heaviest unit among the SH series; it is very durable and it is designed for the long hours of operation. It can remove any dirt you place in front of it. It is equipped with an adjustable thermostat and pressure pop-off, dual wand with side handle and detergent tip, triplex plunger pump with ceramic plungers and stainless steel valves, chemical injection, thermal relief valve, 40’ hose, adjustable pressure, totally enclosed motor, and quick change tips in 0°, 15°, 25°, 40° soap tip. Its oil-fired burner has a rust free burner fuel tank , which heats water to up to 140 F. This unit is intended to be used outdoors and it must be properly vented if used indoors.